June 16, 2014, 4:32 p.m.
A story on the rise of women serving time in prison in the U.S. is the sort of thing you might expect to see from the national desk at The New York Times. If you followed a link to it off Twitter or Facebook, seeing the story’s multimedia features would only support that idea. But the careful reader (or journalist who pays attention to these things) will notice the “Paid Post” small print sitting atop the story. It’s an impressive piece of native advertising, and the credit belongs to the Times’ recently created T Brand Studio, which plans to use many of the techniques and tools of the paper in crafting sponsored content. 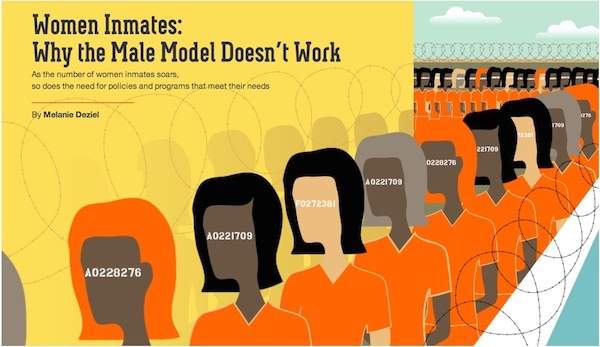 The story on women in prison, sponsored by Netflix in support of Orange Is The New Black, has all the multimedia touches we’ve come to expect on deeply-reported features from the Times. The 1,500-word piece by Melanie Deziel includes illustrations, graphics, and high-quality video and audio interviews with current and former inmates. What you don’t find in the piece is explicit promotion for the second season of the Netflix series. Aside from the logos of both Netflix and the show, Orange Is The New Black only gets mentioned once in the piece, in connection to Piper Kerman, the author of the book that inspired the series. Kerman’s experience in prison is wrapped in with the voices of other former inmates. Like many news organizations deploying sponsored content, the Times makes the distinction that the “news and editorial staffs of The New York Times had no role in its preparation.” The brand studio is an answer to that: a nine-member team that includes editors, designers, videographers, and developers, according to Sebastian Tomich, vice president of advertising and branded content for the Times. The goal is to use the same techniques as the editorial side, but also many of the in-house innovations created by technologists at the Times. The story always comes first, as it would in any newsroom, so the formats chosen are those that best present the story we’re trying to tell. In this particular case, the final formats you see are the result of constant discussion and evolution throughout the process as we discovered what the key parts of the story were. We knew from the start that we wanted both written narrative and video. The illustrations were a fairly early addition when we realized the artistic potential to illustrate some of these heavier themes. Audio was added much later when we realized some of the quotes from the interviews would be even more compelling if they were heard instead of read. It’s still early days for the Times’ expansion into native advertising, which began in January with the redesign of NYTimes.com. The Times has produced paid posts for companies like Hewlett-Packard, and Sotheby’s. Speaking at advertising conference in May, Meredith Levien, executive vice president of advertising for the Times, said readers are spending an almost equal amount of time reading paid posts as news stories. As we assess the content from an advertising effectiveness ​point of view, we ​understand that readers may not always read ​a piece in its entirety, so not only does multimedia make the content richer and more engaging, it also provides the reader with even more value​ at first glance. You’lll see this in a majority of our work going forward. Ellis, Justin. "You can expect more multimedia-rich native advertising from The New York Times." Nieman Journalism Lab. Nieman Foundation for Journalism at Harvard, 16 Jun. 2014. Web. 24 Apr. 2019. Ellis, Justin. "You can expect more multimedia-rich native advertising from The New York Times." Nieman Journalism Lab. Last modified June 16, 2014. Accessed April 24, 2019. https://www.niemanlab.org/2014/06/you-can-expect-more-multimedia-rich-native-advertising-from-the-new-york-times/.